When I have to use a different part of my brain to do them. The process can take a while because the mechanics are all newly tooled and adjusted daily. Retired, in between household chores and; wait a minute, had to clean the cat box. Yes, a much different part of my brain. The upside is that if I had to think about anything it would never get done. The downside is that the old ways of doing things just don’t work anymore. “Work smarter not harder.” Isn’t that what they used to say ? They don’t teach that anymore ! Smarter isn’t what everybody thinks it is. My Special Education guys were getting jobs before regular education guys because they have work ethic and they don’t tell themselves “No – I won’t do THAT!” For me I would start each year with a project they would see me learning, and it had to be as foreign and as hard as something I was teaching them to do. It usually ended up with them looking over my shoulder and giving me ideas, trying to help. ME! The pay- off was that we all learned new things and hard things together. Now, I have to teach myself. Same rule applies. Can’t see? No problem! That’s what the embroidery machine is for. Set it up, push a button and let it go. “Beep”, ok, check tension, thread and needle and let it go! “Double Beep” , ok – part of the program. Even with earplugs each design represents between 2000 and 5000 “beeps” No wonder people give these things away ! 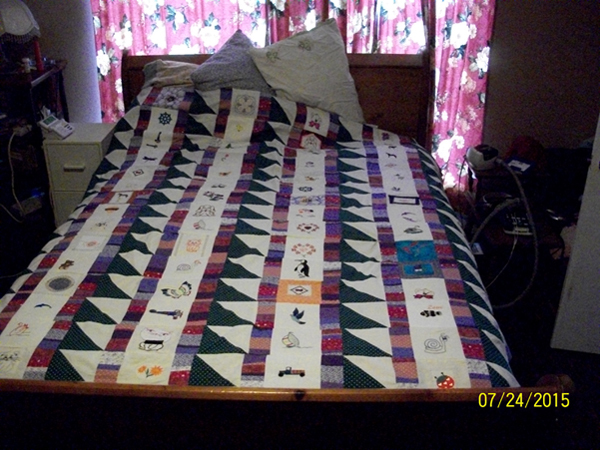 After a couple of weeks and more than a few psychotic episodes, the quilt top is done. Only 10 designs needed outright help due to a breakage or a glitch. A monkey or a parrot could do what I did. However, they would not have suffered the psychotic episodes or thought of the earplugs. IT would not have mattered to them anyway as after a bit, they would forget the rewards and run away. Smart? Or is it the willingness to brave psychotic episodes, using earplugs and sticking with it until the job is done ? * Admin issues: SHARE dementia awareness thru buttons below. If interested in receiving notice of future blog postings there is a “follow” button in the upper left corner (MS Explorer) or lower right (Safari and Chrome). Feel free to leave your thoughts in the form of comments, but please filter your comments with truthful loving kindness to all concerned. If there is an advertisement below, I have no control over what is shown. — copyright by Cecil Ristow on 2015-07/24.